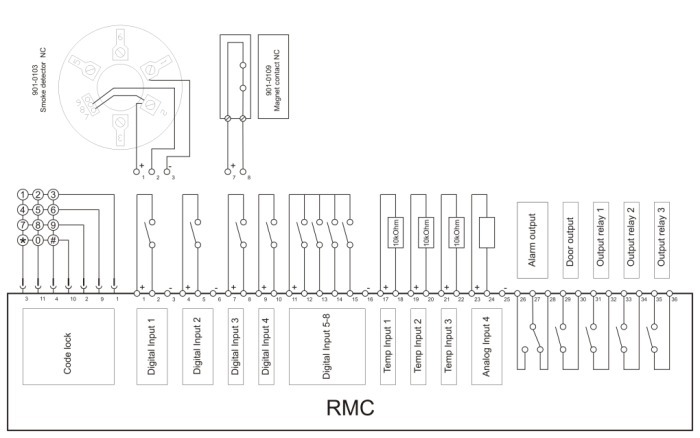 The Rack Multi Control, RMC, is a self contained system for supervising network and server racks. 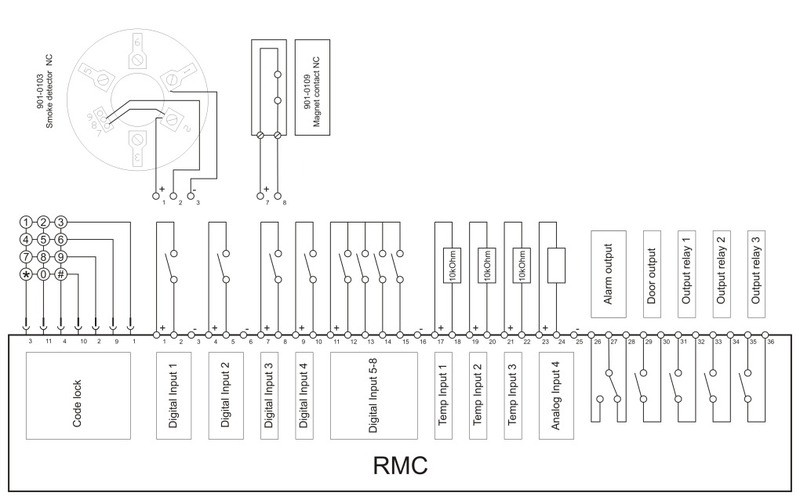 The RMC offers 8 digital and 4 analog inputs as well as 3 potential free outputs. The RMC can monitor temperature, humidity, smoke, moisture, intrusion and much more. Also, in combination with a keypad the RMC is able to perform access control to IT-Racks and Server rooms. After you have logged in on the RMC you can monitor the main page of the graphic user interface which is a virtual copy of the RMC. The top part shows the front of the RMC, below it lists the last 15 events. The GUI refreshes every 60 seconds or in case of an event. When an alarm is raised, notification can be sent to 5 recipients by Email or SMS and via SNMP Traps to a network management system. The RMC was developed to be user friendly, easy to configure and have the ability of communication. The RMC can be attached to the network by Ethernet and configured in a web browser, therefore no additional software is needed. System status and alarm notifications are listed on the main page for easy view. The RMC is made to fit in a 19" cabinet and uses 1 unit size in height. The RMC is despatched ready to use icluding a temperature sensor 0.2m cable, the connector set, the power cable and the mounting kit. The programming of the RMC is realized by a browser (Internet Explorer). After selecting the IP address, the login page is shown. The start page shows the actual status of the in- and outputs. Furthermore, the last 15 events are listed in the log section. All settings can now be easily realised under the position "settings". Please click on the drawing for a larger view.